I was really impressed by this story. Drew called most of the ending, but I think it was still satisfying. There was a lot of heartbreak at the beginning – orphans are always heartbreaking, especially at the tricky age of 12 – and a lot of heart in the ending. I like really liked it. I even tried to pay really close attention so I would actually know if I liked it. I fully recommend it! 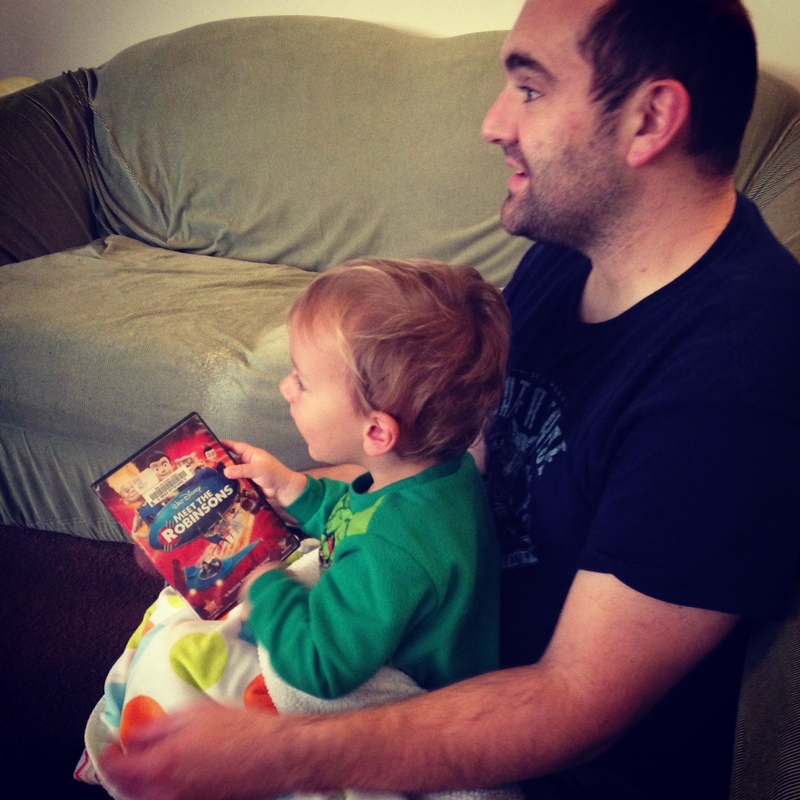 We definitely used the long holiday weekend to catch up on Disney movies – we watched three, so there will be a quick succession of posts about them. We’re in the home stretch now: just 4 more to go! It’s Drew’s and my 8-year dating anniversary. It’s the 1-year anniversary of the day we found out I was pregnant. 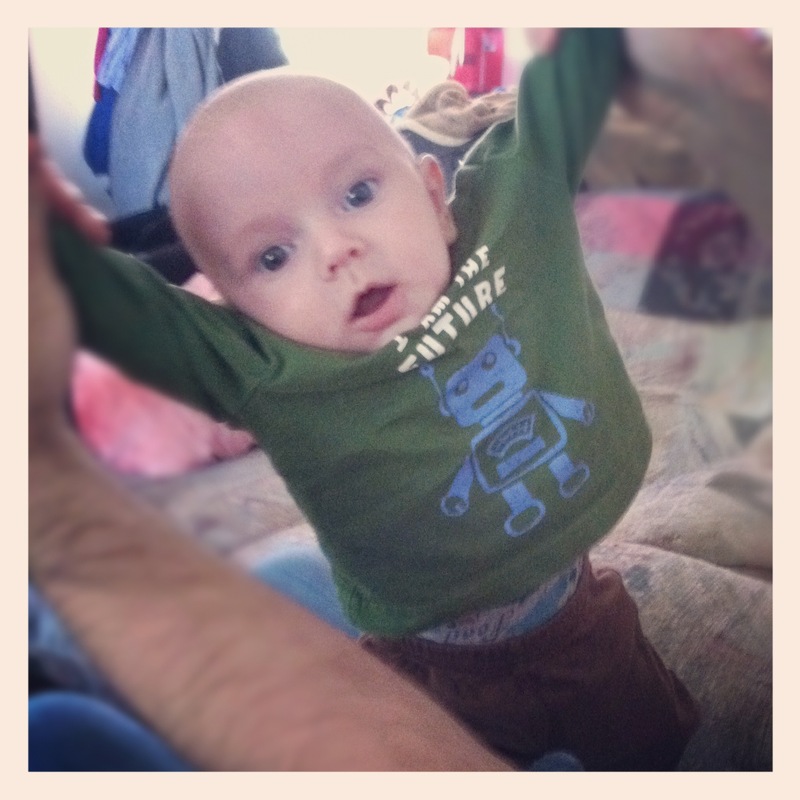 And it’s B’s 4-month birthday! And, as long as I’m wishing for things, maybe we could win the lottery? Baby B’s first thanksgiving! 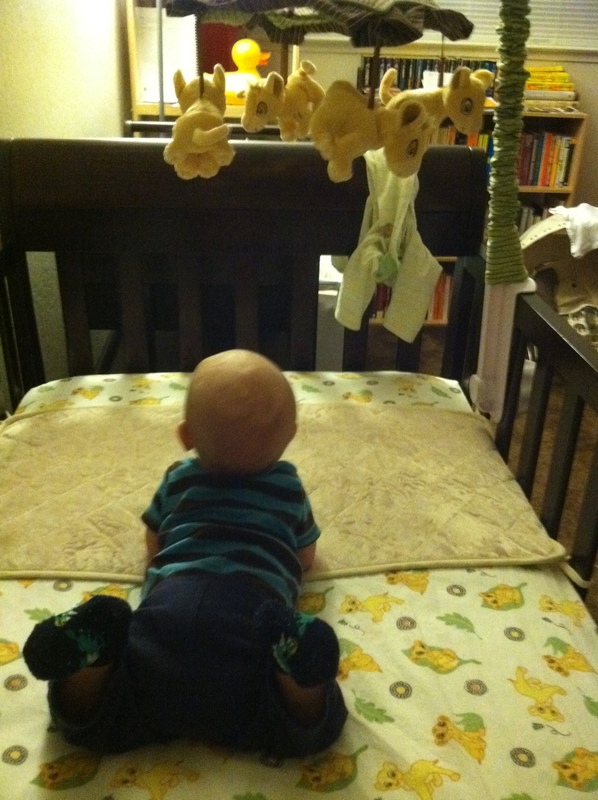 He’s thankful for his Lion King mobile. And so are we, because he loves it and will watch it happily and smile and dance. This allows me to brush my teeth and put in my contacts on the days when Drew is at work. My brother and his wife weren’t able to fly out from Denver, so I’m thankful that my parents came down and we had dinner with Drew’s family, and it was really fun. Drew held him throughout dinner, and we were both kind of up and down with him, so neither of us gorged in that traditional, Thanksgiving dinner way. I’m thankful for that, in itself. But I’m also thankful that we got lots of leftovers to bring home, so we can eventually get our fill of turkey, stuffing, gravy, and all the rest. I’m thankful that B has two sets of awesome grandparents who love him and are excited to watch him grow up. I’m thankful that those two sets of grandparents get along with each other. Last year I was being deliberately optimistic about not being pregnant yet, and I was counting my blessings, and all that. I’m really thankful that this year I don’t have to twist the situation to shed it in a positive light. Most of all this year I’m thankful for my two boys – for the one I chose and for the one who then (finally!) chose us. Stuff like this drives me crazy. Anyway. 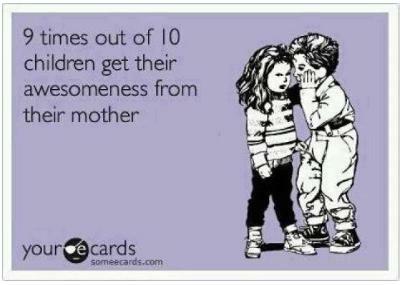 “9 times out of 10 children get their awesomeness from their mother.” What’s being said here? Why are we leaving out the fathers? But this morning, I had to stop and say, “We’re both just kidding…right?” because it’s kind of getting to me. Enough is enough. Dads love their children too, and contribute to their health and well-being and yes, even to their awesomeness. Maybe I just grew up in a very lucky kind of household, where my parents shared responsibilities and were around us equal amounts of time. I would say I get 50% of my awesomeness from my mom and 50% from my dad. And I would say that with a totally straight face. On the other hand, maybe we’ve seen enough of FB e-cards, and enough of comments under-appreciating fathers. Hmm?